Glow Dental Spa (Wayne) - Book Appointment Online! Just as your smile is unique, Glow Dental Spa is unlike any other dental office you will ever encounter. The safety, comfort, and overall satisfaction of our patients are our highest priorities, which is why we offer a wide variety of advanced dental services that can be combined with an array of relaxing spa treatments. Imagine achieving the smile of your dreams while you rejuvenate your skin and restore your mind and spirit. Our luxurious facility is a serine oasis in which you can do exactly that. 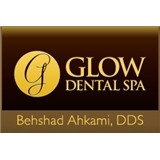 Dr. Behshad Ahkami isn't just a renowned cosmetic dentist in Wayne, New Jersey; he is a true artist who can improve your bite, restore health to your teeth and gums, and bring exquisite balance and symmetry to your smile. To the right is Dr. Ahkami with Jacqueline Laurita from the NJ Housewives after teeth whitening in our Wayne office. I have never waited over 5 minutes. Dr. Ahkami is always extremely eager to correct any minor to major issues you may have as quickly and efficiently as possible. The entire office is super clean & modern. overall great experience everytime.